Ingrid is an avid collector, and with friends who range from photographers to artists, each area is a mini installation and personalises the space. She juxtaposes inexpensive bottles with signed artwork, and pieces found on the beach in Bali with vintage earthenware. The eclectic collection of furniture is a constant work in progress, with trips to markets, traders and antique dealers. The re-upholstered sofas and chairs, saved from the local charity shop, are covered in a fetching white vinyl and work well against a 1970s coffee table discovered in a junk shop. 'Bits and pieces have been collected during our many trips to Bali and Lombok. Most curios were found by chance, poking around, as you do on holidays,' explains Ingrid. 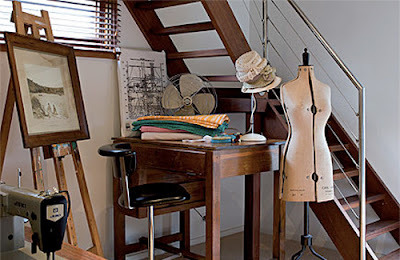 The 1920s mannequin in Ingrid's studio was a 21st birthday gift and has travelled with her for 13 years. Piles of vintage fabrics on the second-hand table await the design process to be transformed into this season's range. The use of Australian wood continues in the spacious bathroom with its ironbark bath surround. The feature porthole was originally from a local ship and the couple bought it in a garage sale. This thoughtful consideration of how they want to use their home continues in the master bedroom. It's the perfect environment for lazy brunches with the twins as the room spills onto a west-facing deck, affording Clif and Ingrid a view of the garden and the activities of the two boys searching the surrounding bush for lizards before reporting back to the house.